Why am I packing and storing 35 plastic promotional cups, but not a single real glass? 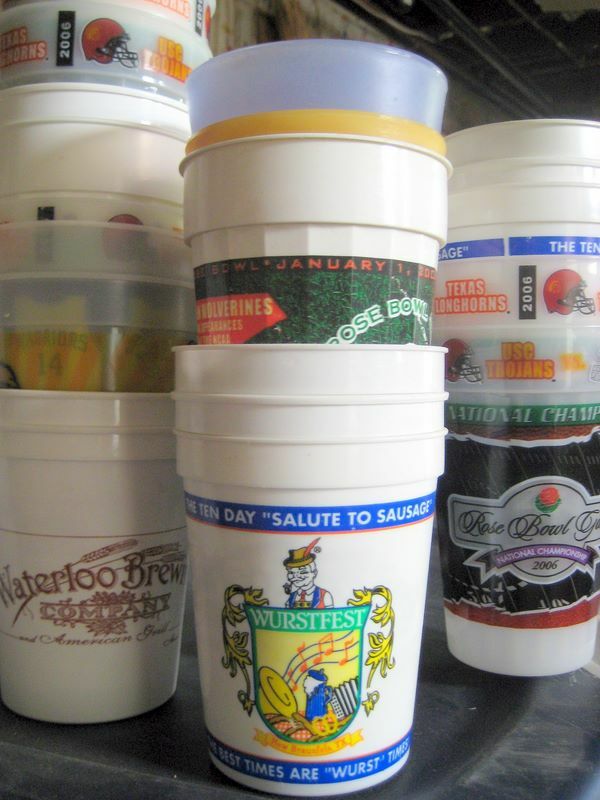 Texas Championship Rose Bowl Cup, Happy New Year 1999!, and Wurstfest: A 10-day Salute to Sausage… you cups will be packed safely away. All other drinkware – wine glasses, coffee mugs, pint glasses, highballs, lowballs, beer mugs, pilsner glasses, and the ever-lingering sippy cups… garage sale or donation pile for you! All of the things I was dreading having to sort through seem so much easier to throw into the donation pile than I expected. All those clothes that never really fit right, but I held on to them because they were pricey — gone! Those questionable clothing items that someone gave as a gift in the best intentions that I thought maybe some day I’ll wear in front of them – donation time. Tiny tiny T-shirts with much loved band logos, that just really don’t fit a gal that’s had a baby — here ya go childless friend! It’s quite liberating, actually. And, of course, I’m looking forward to replenishing my wardrobe some day. However, shoes are another story. Jason’s current packing argument with me: quantity of shoes. Our desired number of shoes per person are 4 pairs apart. may i have your Wurstfest: A 10-day Salute to Sausage cup?